The Professional Identity of Teacher Educators offers a contemporary study of teacher education in a period of huge international, institutional and professional change. The book explores the experiences, understandings, and beliefs that guide the professional practices of teacher educators, and paints a picture of a profession that offers huge rewards, alongside challenges and frustrations. What are the responsibilities of the job and how does it re-shape the professional identity of those who do it, day in, day out? What are the challenges and opportunities for teacher educators arising from constantly evolving education policies? Drawing on the findings of a phenomenological study of the professional self-image and identities of pre-service teacher educators, this book provides an account of how a number of teacher educators have come to terms with their own identities as professionals at a time of considerable institutional turmoil. Moving beyond these individual stories, broader theoretical issues are also addressed: are there some distinctive but common elements that might distinguish the professional identity of the particular group we call teacher educators; and if there are, what might those characteristics be? teacher educators as a community of practice. Ronnie Davey provides a unique and compelling report on cutting edge teacher education research, encapsulating the major issues associated with being a teacher educator, and how that influences and shapes teacher educators’ identity. 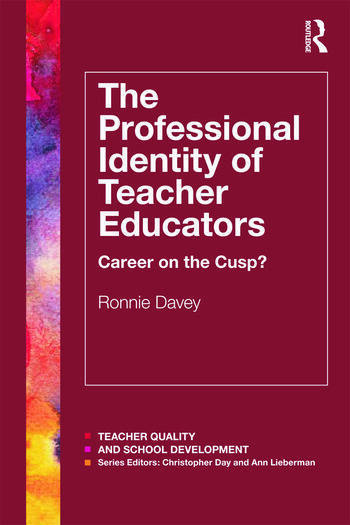 This book will be invaluable reading for teacher educators and researchers with an interest in professional identity and teaching in Higher Education. Ronnie Davey is a Principal Lecturer at the University of Canterbury College of Education, Christchurch, New Zealand.